Integrated ERP reduces business costs and also enables to eliminate duplicate work efforts across multiple areas via one unified system. A cloud based version can enable to achieve double benefits as the combination of increased visibility into task performance, real time reporting and remote access can yield the boost for your sales. Despite such a solid reason for an enterprise of any size to adopt a cloud based ERP software it is more than evident that efficiencies may not alone fetch revenues. Deploying the system strategically to improve sales will fortify profits from both the logistic perspective as well as most aptly a marketing one. When you are offering products and services to customers that pay you need to execute an effective sales process. In a customer centric culture a great product or service is no doubt important but how you sell or serve has equal importance. Thus the responsibility for sales productivity extends from the sales reps or managers who further need to scrutinize other areas in need of improvement and establish a communication to these levels of management who can make informed reactive business decisions. 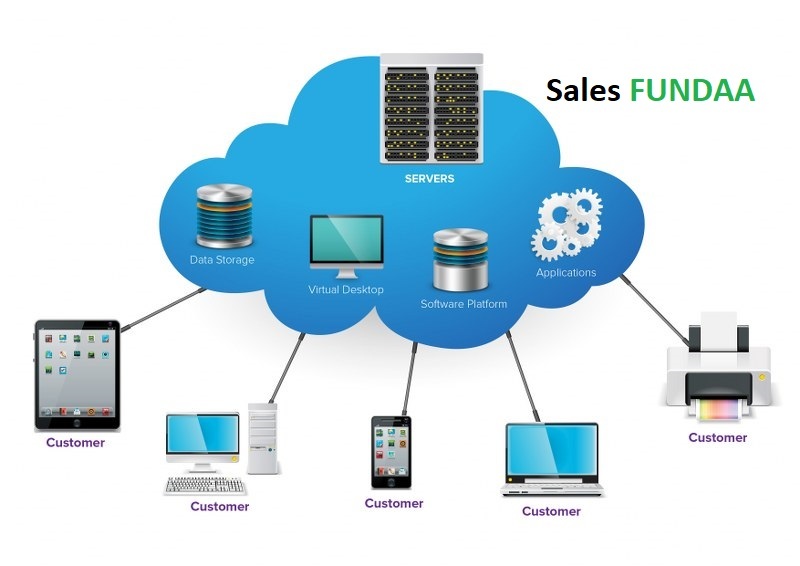 A salesfundaa ERP for sales and services software due to its cloud disposition facilitates total visibility in real time making it easier to identify areas within the sales process that may be causing a stumble block for success and anticipating a solution and expediting its implementation. Deploying the right technology is the correct way to address sales productivity. But most CRM software may enable managers only to observe what their team is doing on a granular level. And unless it is scaled to an enterprise level they cannot get to the depth of data that is pulled together from across the entire organisation and run detailed reports such as sales order vs. invoice reports or even conversion rates which can be achieved by linking financial software to a CRM software. Scaling to a salesfundaa ERP for sales and services also allows clarity into quoted values vs. actual cash sale values to ensure GP and margins are maintained. A salesfundaa ERP for sales and services can effectively manage multiple sales teams with their own variable set of metrics and performance targets. It can be deployed to compare team specific data with regards to profit- per- sale vs. costs, performance of individual team members,and the time of day/week for optimum performance – in order to establish how to best augment sales across the entire company. An ERP and CRM integration can throw light on some of very important proven statistics. They are capable of revealing facts about who are the potential revenue generating customers. According to the market bizz-word 80% of sales are generated from 20% of existing customers and this revelation was way before the ERP and CRM technology penetrated the market landscape. The Advent of this technology just automatically revealed that conversion rates for people who have purchased from you before can be up to 8 times greater than first-time buyers and that to with an estimated higher order value. Focusing your marketing efforts in this direction is key to maximising sales. And this can be only achieved through salesfundaa ERP for sales and services and salesfundaa CRM software integration a system which gives access to information – regarding everything from past client interactions to previous order history, their payment terms, how much they paid, their preferred marketing channel and the products / services they’re most interested in. It helps in formulating sales process strategies and allows representatives to effectively reach out to buyers on a more personalised level. It also enables management to observe and invest further resources into strategies that have proven to be most successful. The functionality of being able to view inventory is another benefit of system integration. It may be not directly related to the sales process but is equally important. It also allows to double check if existing stock levels is sufficient and decide if more stock is due to improve ease of order and secure the sale. Delivery to some customers may be more convenient (quicker and cheaper) from depots nearer to a particular customer’s location. So remote access to shipping and inventory information via the cloud is an advantage. The salesfundaa ERP for sales and services data can be used to provide sales representatives with suggestions for new pricing structures on a case-by-case basis. Whilst setting the price of products and services is not the primary role of your sales team, Use of pricing groups and values enables a quick and easy view of best value offerings to your customer base, adding a valuable tool in your sales team’s arsenal. If remote users are given access via the cloud, it enables sales to react in real-time to national and global changes in the marketplace. Call today o 923 35 35 35 to get your free demo of the salesfundaa ERP for sales and services.